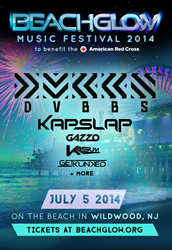 BeachGlow: Concerts for Charity, Inc., the only non-profit EDM (electronic dance music) concert producer in the nation, will come to Wildwood’s world-class beach with BeachGlow Music Festival 2014, on Saturday, July 5th, from 3 to 11 p.m. A multi-act show headlined by Dvbbs, the chart-topping EDM duo from Los Angeles, will be just off the boardwalk on the sprawling beach between the amusement piers. Proceeds will go to the American Red Cross Disaster Relief Fund. Tickets go on sale Sunday, April 6th at http://www.ticketfly.com. Joining Dvbbs in the musical line-up at this eight-hour event is Kap Slap, the NYC-based and internationally-known EDM DJ, producer, and mash-up artist. At least six other musical acts will support the headliners, including New Jersey native and fast-rising remix artist Gazzo; and Kasum, a NYC- and Boston-based artist performing melodic dubstep, progressive house, and electro house. Dane Kunkel, founder and CEO of BeachGlow – and remix artist — also will have a spot in the festival line-up under his DJ name, Get KunKed. BeachGlow’s mission is to use the power of today’s youth-oriented music to bring together an audience for a great time and a great cause. The company hand-selects or “adopts” individual charities to be the recipient of its profits from each concert or festival. Past recipients include the Breast Cancer Research Foundation and Harmony Ministries in Haiti. Several companies have generously jumped on-board this charitable event to benefit the Red Cross as official sponsors. Coca Cola, Coors Light, Comcast Xfinity, and Wired 96.5 will be lead sponsors of this year’s festival – and the list keeps growing. “Alone, we can only do so much…Together, we can do anything,” says Kunkel. BeachGlow: Concerts for Charity, Inc. is a non-profit, all-volunteer organization that is dedicated to producing concerts and festivals to benefit worthy charities. The company, which is 501(c)(3) status pending, was founded in 2011 by Dane Kunkel, who was 16 at the time and working virtually alone. Today, Kunkel heads up a board of directors, a growing staff, and many, many volunteers who make it possible to raise money and awareness for a cause. More information about the company and this year’s festival – and a press kit – can be obtained at http://www.beachglowevent.com. What a great cause/ way to bring people together!